The best platform to manage deal flow, improve deal-sourcing, and conduct due-diligence. 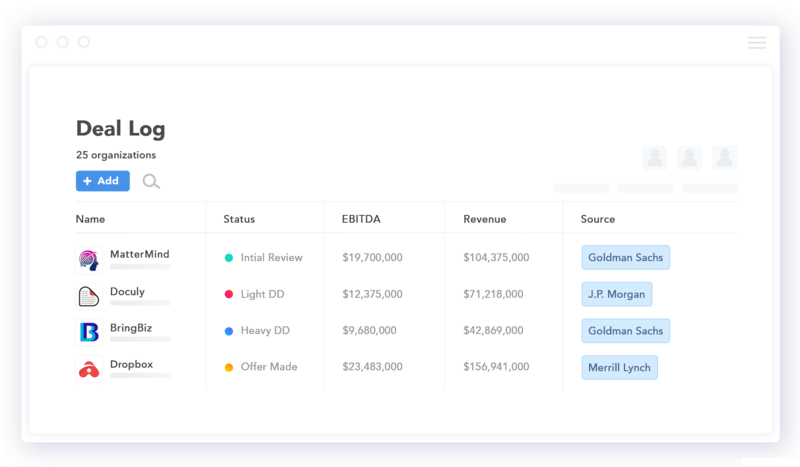 Affinity automatically analyzes your team’s communication data and augments it with trusted third-party data to build the ultimate virtual relationship Rolodex. Gain a holistic view of all your relationship activity including the dates of the first and last email sent, any attachments sent, whether an email has been overlooked, and even who facilitated the introduction. With Affinity, team members understand the full context of external relationships and can avoid crossing any wires. Nothing is more effective at helping you get in the door as referrals and warm introductions. 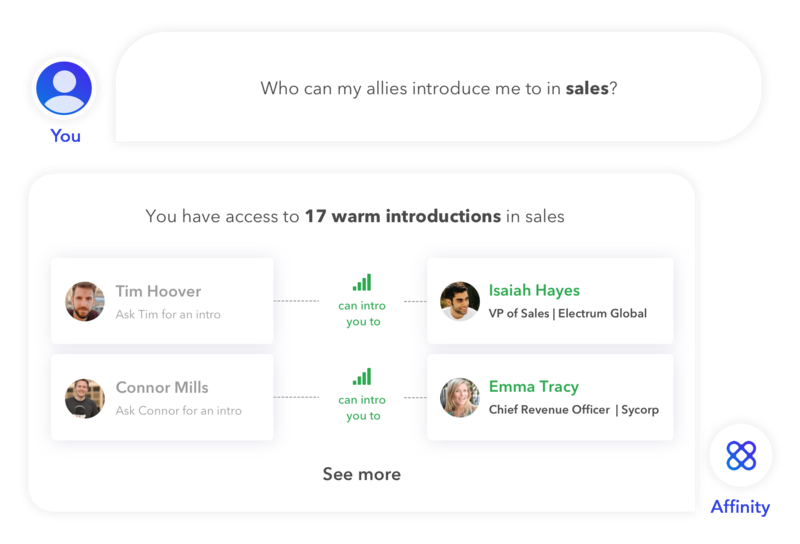 With Affinity, eliminate the guesswork involved in asking for introductions. Stop cross-checking LinkedIn, your CRM system, and other platforms hoping to stumble upon the right individuals to make introductions. Affinity's patented technology and proprietary Alliances feature allows you to connect with your most trusted business allies and effortlessly leverage their network to close your next big deal. Stop wasting time manually inputting data. 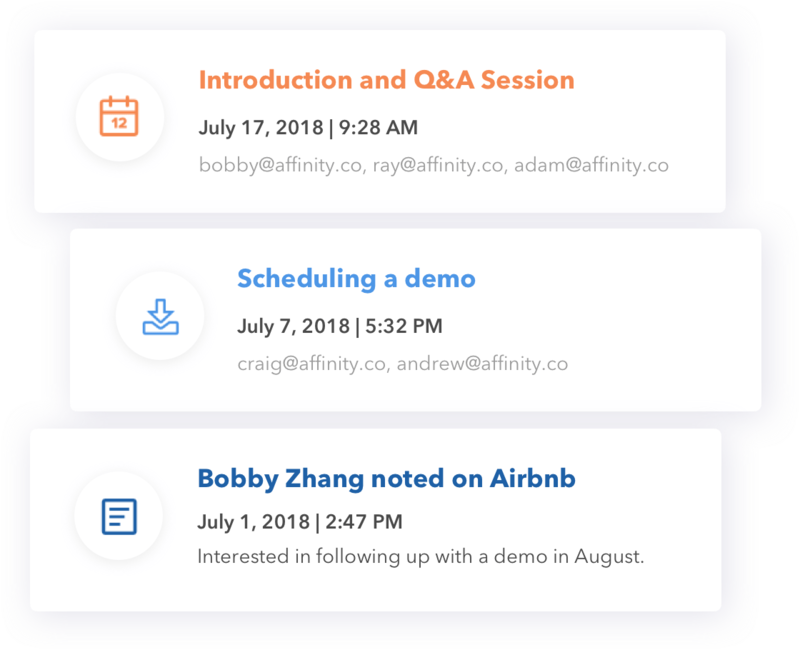 Affinity integrates seamlessly with your email and calendar to automatically track who your team has communicated with, what files were exchanged, and who provided the introduction. We also enrich your contacts with key attributes directly from Crunchbase (company stage, last funding date, lead investors, and more), as well as our proprietary database.